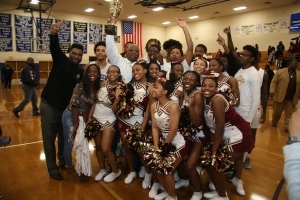 The Tucker Tigers defeated Mundy’s Mill 52-39 to win the Region 4-6A title on Saturday night. The No. 7 ranked Tucker Tigers pulled away in the second half on the way to a 52-39 Region 4-6A championship victory over the Mundy’s Mill Tigers. Tucker (24-4) led just 13-10 after the first quarter and 21-16 at the half as Mundy’s Mill (21-7) would not let the Tigers get too far ahead in the opening half of the title game. Jermontae Hill played a big role in the game with 20 points on the night and Nick Watson added 12 as the Tigers won their seventh consecutive game and 14th of their last 15. Tucker will host Region 1 No. 4 seed Valdosta next Saturday with a time to be announced. In Region 4-6A girls’ action, the No. 6 ranked Stephenson Lady Jaguars (17-11) knocked off region and DeKalb rival Martin Luther King Jr. Lady Lions (14-14) 63-47 to garner the No. 3 seed out of the region. Stephenson goes on the road in the first round of the Class 6A girls’ state playoffs with a trip to Northside of Warner Robins. A date and time has yet to be determined. King goes on the road to Region 1 No. 1 seed Valdosta. 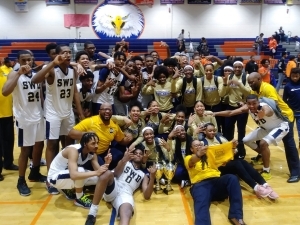 Southwest DeKalb swept the Region 5-5A boys’ and girls’ championships on Saturday night. The No. 4 ranked Southwest DeKalb Panthers (21-6) and No. 7 ranked Lithonia Bulldogs (18-9) split their two regular season meetings so they decided to play overtime at Columbia on Saturday night with the Panthers pulling out a 61-59 victory. The Panthers trailed 34-21 at the half, but came storming out of the break to knot the game at 44-44 heading into the fourth quarter. Southwest grabbed a 50-48 lead with just five minutes to play and went up 55-53 with 29 seconds remaining. Lithonia came out of a timeout and Eric Gaines had a put-back dunk on an offensive rebound to tie the game at 55-55 with 13 seconds left on the clock. The Bulldogs trailed 60-59 and the Panthers missed two free throws, but a pair of turnovers and foul had the Panthers’ KD Johnson at the line for two with 2.5 seconds remaining. He hit one of his two charity shots and Lithonia could not score in the final 2 seconds as the Panthers held on for the win. Southwest DeKalb will host Clarke Central next weekend and Lithonia plays host to Loganville. In the boys’ third place game, the Columbia Eagles (15-10) picked up the No. 3 seed with a 50-42 win over the Miller Grove Wolverines (10-18). Both teams must go on the road in the first round of the playoffs as Columbia travels to Cedar Shoals and Miller Grove heads to Buford. Southwest DeKalb made it a sweep of the region titles as the Lady Panthers (21-6) got past the Columbia Lady Eagles (20-7) 55-46 for the top seed. The Lady Panthers will play host to Cedar Shoals while Columbia plays the host role against Loganville. Adrieanna Brownlee was force in the post for Southwest DeKalb picking 15 points, 5 rebounds and 2 blocks. Jayla Kimbrough tossed in 10 points to go with a pair of rebounds and 2 steals. The girls’ third place game had Arabia Mountain Lady Rams running off to a 68-35 win to pick up the No. 3 seed for the state playoffs. Kennedi Manning had a big night inside with her offensive rebounding to lead Arabia Mountain in the win. Arabia Mountain (19-5) travels to Clarke Central for first round play while Chamblee heads to Buford. Redan (13-14) at Morgan Co.